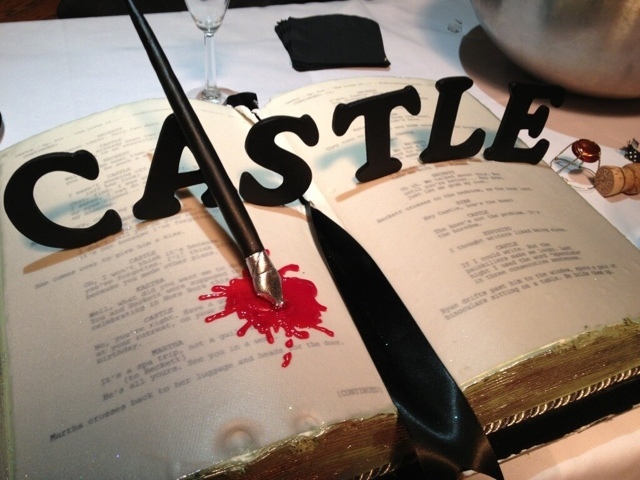 Our favorite cameraman Andrew posted a picture of the cake for Castle's 100th episode. As we took a closer look we can make out two pages of script for this episode, The Lives Of Others. Almost there. Only two more weeks. But it's already been two weeks. Two weeks is an eternity. you won't be such a show off. it's not because I've forgotten. She comes over to give him a kiss. because you made other plans. It's a spa trip, not a guilt trip. He's all yours. See you in a week. Martha crosses back to her luggage and heads for the door. As nice as Bora Bora? They turn to see ESPO and RYAN enter as Martha scoots off. time to make you breakfast. just let me grab my coat. Beckett crosses to the bedroom, as the boys land. Hey Castle, how's the knee? I thought writers like being alone. night I used the word "speculate"
binoculars sitting on a table. He holds them up. As we had already a previous spoiler with just the two words Rear Window, it seems like the episode will be similar to the movie Rear Window in the way that their will be a murder spotted from the apartment of Castle. Are you looking forward to this episode, that actually will air on Richard Castle's birthday, April 1st?